In the event of a fast moving wildfire, evacuating Black Canyon down one lane of Mountain View Avenue could be a life-threatening situation. There are approximately 274 homes in the canyon area, many of which are near the open space. The ability to move people out as quickly as possible is critical. Dominican Heights residents have asked for a number of years to be able to evacuate the 105 homes (from Sienna up through Dominican Dr.) via the gate at the end of Sienna Way. This gate has been locked for years. The gate is now unlocked, along with the chain link further down the path. While the trail gate (above) is on City property, the road beyond is private property until it reaches Linden Lane. We have agreement with San Rafael Fire Chief Christopher Gray and the property owner to unlock these barriers for emergency evacuation only. The residents on Mountain View Ave and connecting streets will continue to evacuate down Mountain View Ave. to Grand. You might want to take a moment to stop by and look at the gate. 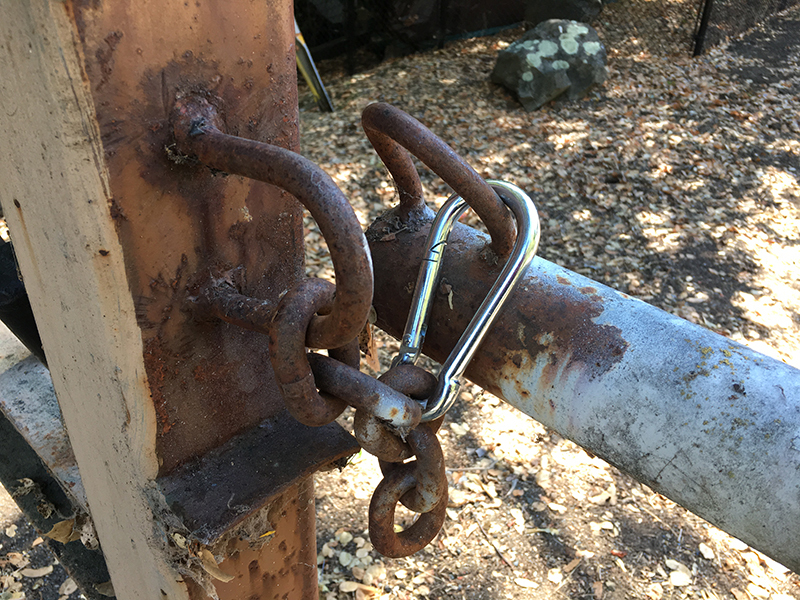 The gate is closed with a 4” carabiner (see photo above). 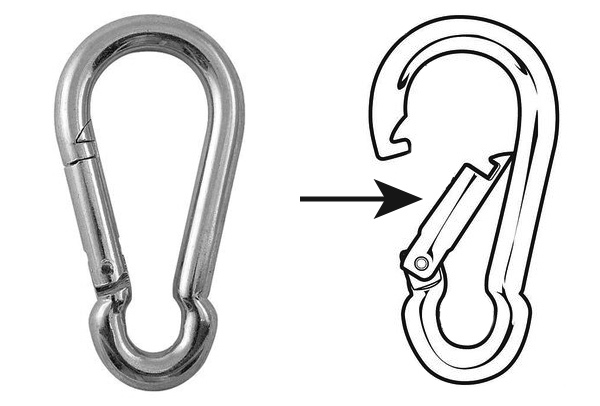 To open, simply push in the side segment (see below) and weave the carabiner out of the gate latch. The gate has been oiled and easily opens. Further down the path is a chain strewn between two wood posts. 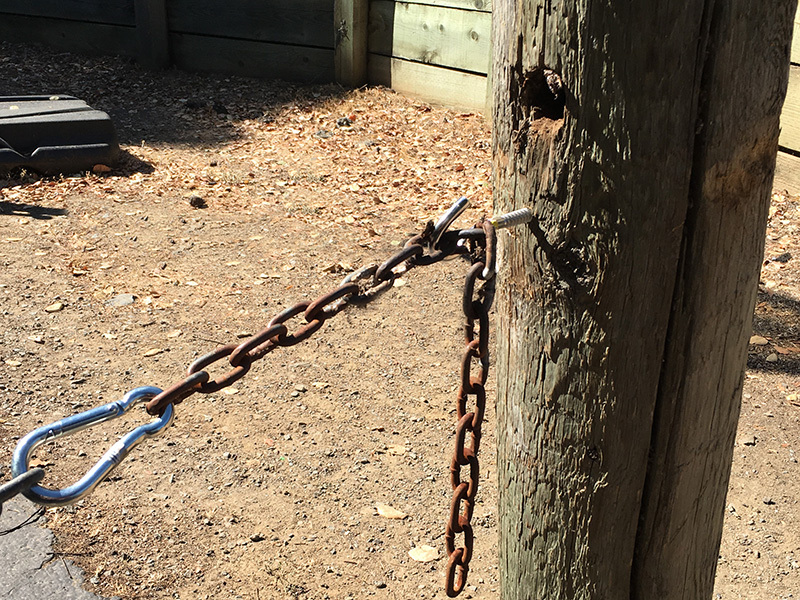 The chain now sits on a hook on the right hand post. Just unhook it. It is important that everyone know this exit route is available, but also respect that this is private property and, in no instance, use this route for anything other than emergency evacuation. In the event of a wildfire, is recommended that you evacuate as soon as possible. If you wait for a mandatory evacuation message from the first responders, it may be difficult for you to get out. It is possible in an evacuation that taking this route will not be the safest exit. Follow the directions of first responders at all times. If you have questions or comments, send an email to DBCNA.info@gmail.com.